> Physics>Electricity & Magnetism>Electricity>Motor Generator. Experiment with AC and DC operation. Build a magneto; universal motor; series and shunt generator. Dissectible device shows crucial similarities. Good for basic training in electricity. 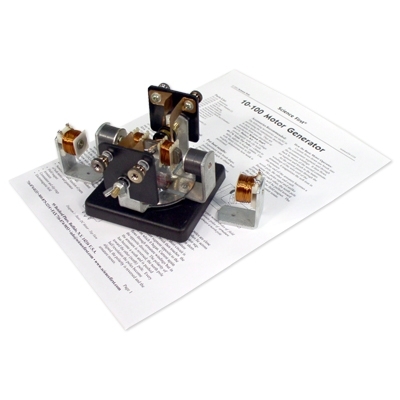 Includes: 2-pole armature; field coil pair; permanent magnet pair; 4 brushes; commutator and slip rings; instructions. Field coil and permanent magnets are on interchangeable brackets. You need a 6 V DC power source.